Syrian army units continued their military operations towards Badiyah of Sweida, targeting Daesh (ISIS) terrorists� hideouts and gatherings and canvassing large areas to cleanse them of terrorists� remnant hotbeds. 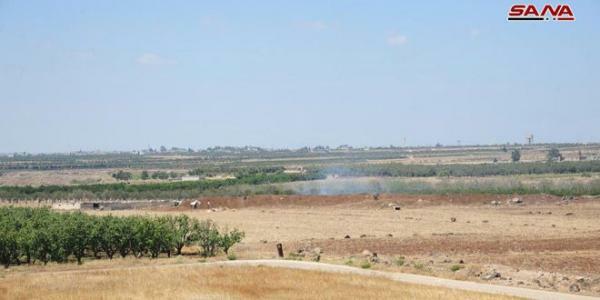 SANA reporter stated that the Syrian army, in cooperation with backup forces, advanced 15 km into the eastern and north-eastern countryside of Sweida, taking control over strategic sites and hills. The reporter added that the Syrian air force carried out intensive airstrikes against Daesh terrorists� center in Sheikh Hassan tomb area east to Khirbet al-Ambashi, 20 km in the depth of Sweida�s Badiyah, killing more than 70 terrorists and destroying their weapons, ammunition and vehicles. On the other hand, army units and backup forces foiled infiltration attempts by Daesh terrorists and engaged in fierce clashes with terrorists near al-Husn area, leaving scores of them killed and injured.